One of the things I've enjoyed most about having this blog is getting to meet so many great people. One of these people is Heather Archuletta, the author of a really interesting blog called Pillow Astronaut. She works in bioastronautics at NASA JSC and was a subject in a 2008 NASA bed rest study on the long-term effects of microgravity on the human body. Her blog focuses on that and other space-related topics. 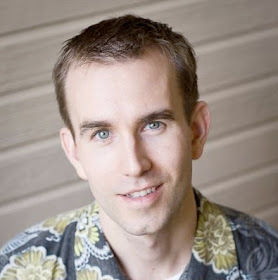 Heather did me the honor of mentioning me in a recent post, so I'm returning the favor for her today. 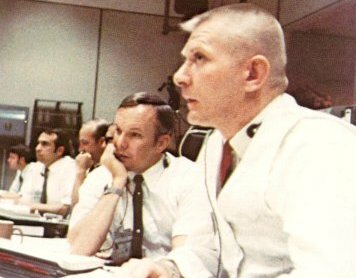 The name Gene Kranz conjures instant recognition among any true space cadet. Sporting his signature crew cut and vest, Kranz served as Flight Director for nearly every spaceflight from Mercury 1 through Apollo 17. As he described in his book, he kept his cool in many difficult situations, most notably the Apollo 13 disaster. 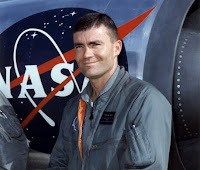 Fred Haise was Lunar Module Pilot on the Apollo 13 mission. In the 1970s, he was involved with the development of the Space Shuttle. I think it's especially cool that he's was Commander on 3 of the 5 test flights of the Space Shuttle Enterprise. He's the only person who can brag that he's survived a harrowing space disaster and flown the Enterprise. The other three videos feature Kranz introducing the Apollo 13 mission (video 1), Haise talking about taking pictures of the Moon (video 3) and Haise boasting about the accuracy of their eventual splashdown (video 4).